Irish Hills Farm produces quality American Saddlebreds. We are currently stand High Point's Ivory Coast (cremello ASB). We are no longer producing Quarter Ponies. We produced are last foal by Luck of the Irish in 2011. Luck of the Irish (palomino IQPA) has been gelded. He is going back to training and showing in 2013. We nominate our stallions often to a variety of stallion service auction. They are currently nominated to IA Limited Breeder's Stallion Service Auction, and Lamoine Trails Saddle Club Futurity. Check them out for a good deal on the stud fee. High Point's Ivory Coast will be nominated to the IL Saddlebred Horse Futurity, IA Saddlebred Horse Futurity, Get of Gold, and Lamoine Trails Saddle Club Futurity. If you have stallion service auction or futurity, you would like us to nominate, contact us about nominating. 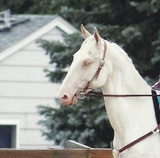 High Point's Ivory Coast (Ivan) is a 2008 Cremello American Saddlebred Stallion. He is by Sunrise's Salty Ranger and out of The Crystal Slipper. He stands 16.2 hands. Ivan is a nice big colt with lots of natural motion and presents with that look at me attitude. He comes with that wonderful people person disposition. Look for him in the show ring. He will stand to limited number mares in 2013. Ivan is the only cremello to be Grand Nationally nominated; however, the American Saddlebred Association has discontinued this program. For discounts on stud fees check out the various stallion service auctions, Ivan has been nominated too. He has been nominated to IL Saddlebred Horse Futurity, IA Limited Breeder's Stakes, IA Saddlebred Futurity, Get of Gold, and Lamoine Trails Saddle Club Futurity stallion service auction. Links coming soon! High Point's Ivory Coast Pedigree includes: Hide-A-Way's Firefly Supreme, Desert Gold Mine, Desert Supreme Memories, Desert Supreme Admiral, Courageous Admiral, Pinetree Denmark, Wing Commander, Sultan's Santana, and Indiana Ace. For more information, check out High Point's Ivory Coast page. 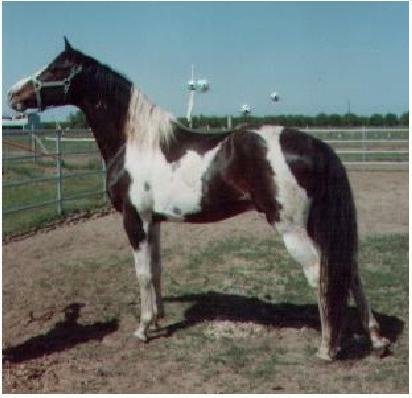 Johnny's Little Patches is a 1983 bay/white tobiano American Saddlebred Stallion. He is 5-gaited. He is also registered with Pinto Horse Association. He is life time nominated stallion with National Show Horse Registry. Both he and his offspring have been successful in the show ring. Johhny has been nominated to stallion services of Lamoine Trails Saddle Club Futurity and the QCABHA Futurity. Johnny's Pedigree includes: CH Rick Rack, CH Wing Commander, Anacacho Shamrock, Shamrock's Golden Boy, Boubon Masterpiece, and Stonewall King. For more information and pictures of his offspring, check out Johnny's Little Patches page or click the picture. Luck of the Irish (Lucky) is a 2002 Palomino Quarter Pony. He is registered with IQPA and is eligible for AQPA. He is HYPP N/N. He is by Barely and out of Red Lady Luck. Lucky offers good performance conformation, fantastic movement, and great disposition. Both he and his offspring have been successful in the show ring. He has been gelded. Lucky is headed back to training and show ring for 2013. Luck of the Irish Pedigree includes: Impressive, Lucky Bars, Sugar Bars, Three Bars, Leo, Royal King, Silver King, King, and Old Sorrel. For more information and pictures of his offspring, check out Luck of the Irish page.